A new look GigaDB. Data publishing gets more interactive and FAIR. As we continue to push the envelope for publishing in the life sciences we have been listening to our users about the things that should be incorporated into the publication process. That is why we have taken the opportunity to not only freshen the appearance of the GigaScience Database (GigaDB) website, but also to include the addition of widgets within the framework to allow for a wide range of additional features to be incorporated directly within the GigaDB datasets. 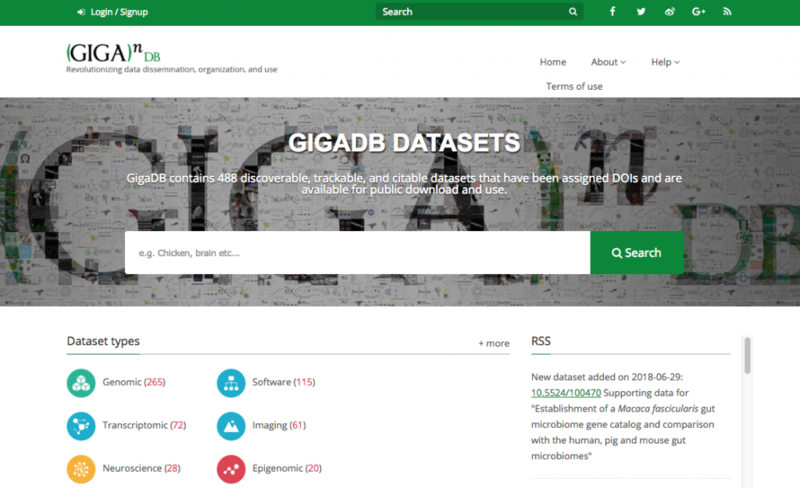 Here we describe the latest release of GigaDB.org (as presented at ISMB 2018 Chicago) which has recently undergone a complete overhaul to improve the user experience. Our team has continued improve and develop the database over the years, but this is the biggest update to the look of the platform since the 2014 (see the publication describing that version in Database Journal). Every page has been redesigned to allow faster navigation and improved visibility of links to related resources, including those hosted by external services as well as those on our own servers. New Tools to explore and discover the great data we publish. The Sample Map Browser (above) allows users to discover samples that we have data for by geographic location of that sample (only available where submitters provide GPS coordinates). Handy for geographically spread datasets such as camera trap data (see GigaBlog for an example of a camera trap study we published). Incorporation of the 3D visualisation widget from SketchFab (below) enables interactive visualisation of surface-rendered reconstructions of 3D imaging data, such as microCT scan reconstructions (see the hermit crab examples in GigaBlog that showcase this nicely). We also have the ability to include Code Ocean widgets to display the interactive code of datasets where this is provided by the authors. This allows users to rerun the published pipeline/code on different datasets, or with altered parameters. We now have a couple of examples of software (what we call Technical Note) papers utilising Code Ocean integration including the recent Genome Annotation Generator tool (see widget below). In future developments we wish to provide more tools for visualisation of data with a view to increasing data accessibility and reuse. If you have opinions about the new look GigaDB and tools that we could offer please get in touch or leave your comments below. Practising what we preach regarding open source, you can also comment and issue pull requests on the GigaDB-website GitHub repository. Data Editor for GigaDB journal.